China checks out my sweater. Even though there are no "Knitting Police," there are definitely Knitting Inspectors and Fabric Testers. 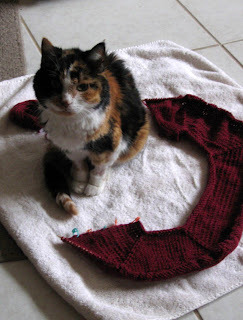 The Inspectors have been monitoring the progress of the Mr. Greenjeans sweater projects. Here is my progress for the second day (days are not necessarily consecutive). I have about two more 6-row repeats before I get to the dividing row (where the sleeve stitches are put onto waste yarn). I need one more episode of Harry's Law to get to that point. Lois is using the color #40805 Lichen (Fibra Natura Sensational) for her sweater. This is a gorgeous color! She has already gotten to the dividing row. Lois is using Fibra Natura Sensational in color Lichen. Lois' Knitting Inspector has approved her work.